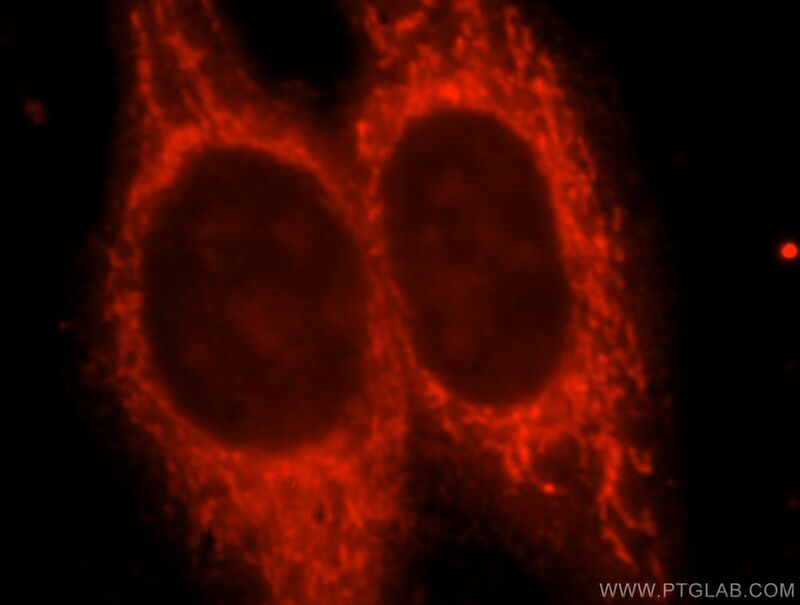 Immunofluorescent analysis of HepG2 cells, using KCNJ11 antibody 16920-1-AP at 1:25 dilution and Rhodamine-labeled goat anti-rabbit IgG (red). Kir6.2 (also known as BIR or IKATP), encoded by the KCNJ11 gene, is the pore-forming unit of the ATP-sensitive K+ channel, an inward-rectifier potassium ion channel. Kir6.2 is controlled by G-proteins and is found associated with the sulfonylurea receptor (SUR) to constitute the ATP-sensitive K+ channel. The KCNJ11 gene is located at 11p15.1 and has no intron. Mutations in KCNJ11 are a cause of familial persistent hyperinsulinemic hypoglycemia of infancy (PHHI), an autosomal recessive disorder characterized by unregulated insulin secretion. Defects in KCNJ11 may also contribute to autosomal dominant non-insulin-dependent diabetes mellitus type II (NIDDM), transient neonatal diabetes mellitus type 3 (TNDM3), and permanent neonatal diabetes mellitus (PNDM).